Did you know I live in a bilingual community? Most people know Canada has two official languages – English and French – but you may not know that French isn’t just for Quebec! There are Western towns like mine where French is alive and well! Signs are bilingual, French is spoken in the streets and my kids attend French immersion schooling. All that hasn’t improved my French much! I’m banking on my children translating me through French wineries and Parisian museums one day! Nonetheless I have many awesome bilingual friends and work with many bilingual teachers in my day job including Rachelle! 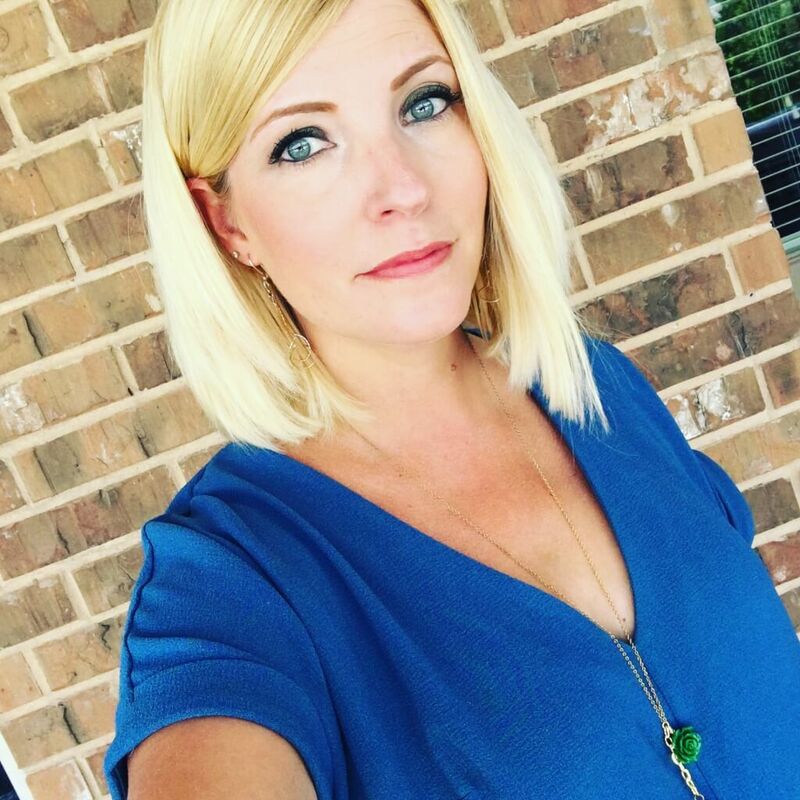 Rachelle is kind enough to follow my blog and recently changed from a alternating-days teaching gig to an every day assignment. That meant she had to adjust to wearing work clothes every single day! I would respond to this predicament by immediately going thrifting for 50% more clothes, but Rachelle instead asked for my help to find some new outfits within her existing wardrobe. Mais oui, sounds magnifique! 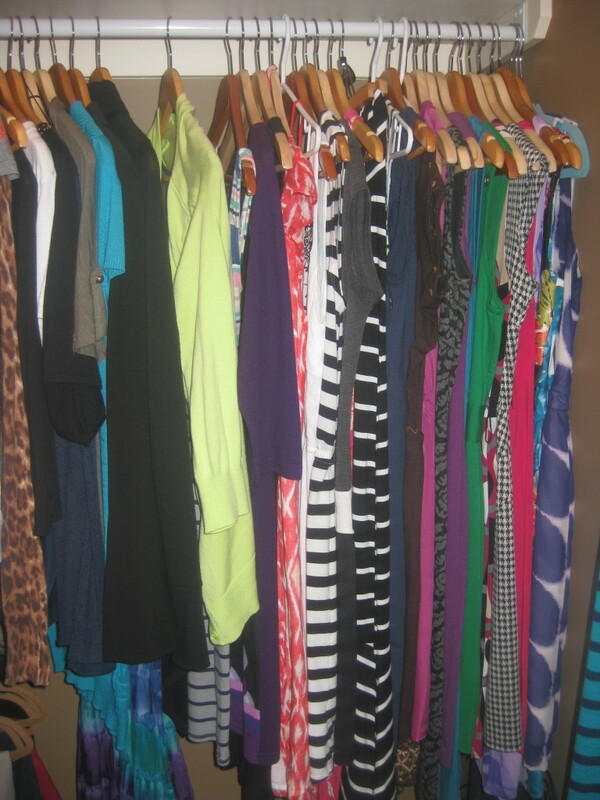 Rachelle’s closet before we started. 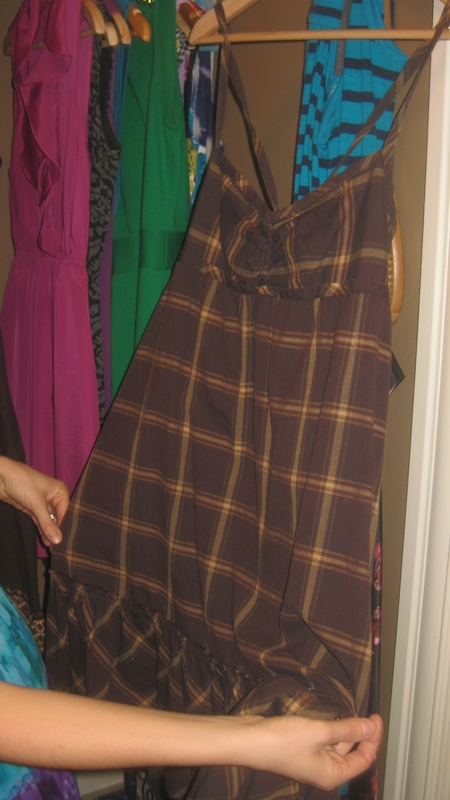 Rachelle loves dresses – a girl after my own heart! AND there’s a full-length mirror on the front! Pretty colour but the layered pieces feel dated. Au revoir! Rachelle pulled this out and I thought “belle!” and she said, “je deteste!” so it went. No explanation needed. 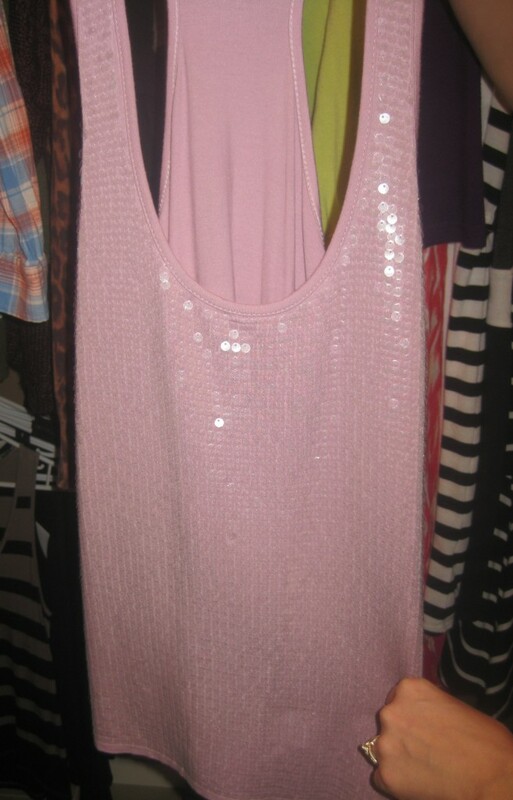 The sparkly fabric and tight fit are just too much! Most garments can only pull off one striking element at a time. 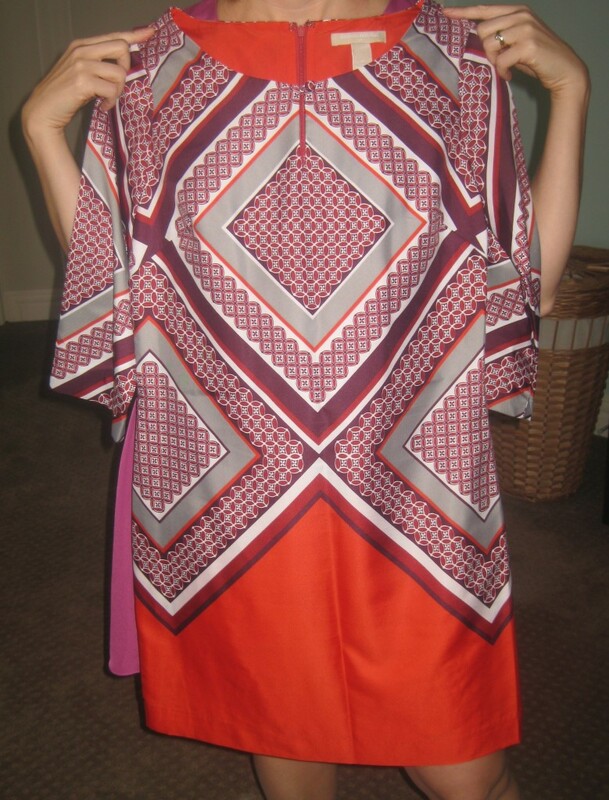 Plus, this style is reminiscent of a maternity top – mais NON! The perfect striped tee… with a HOLE. Sigh. Rachelle will look for a new striped top to replace this one. Once you know there’s a hole, there’s no going back to your ignorant bliss. 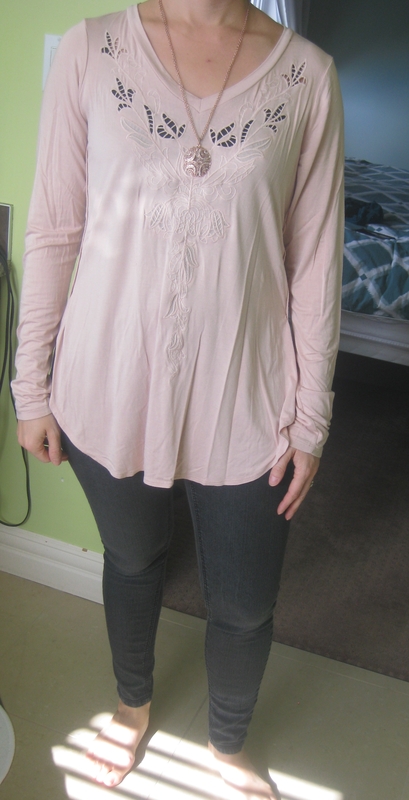 Rachelle loves the colour and cut of this pretty top, but it’s a smidgen too tight. 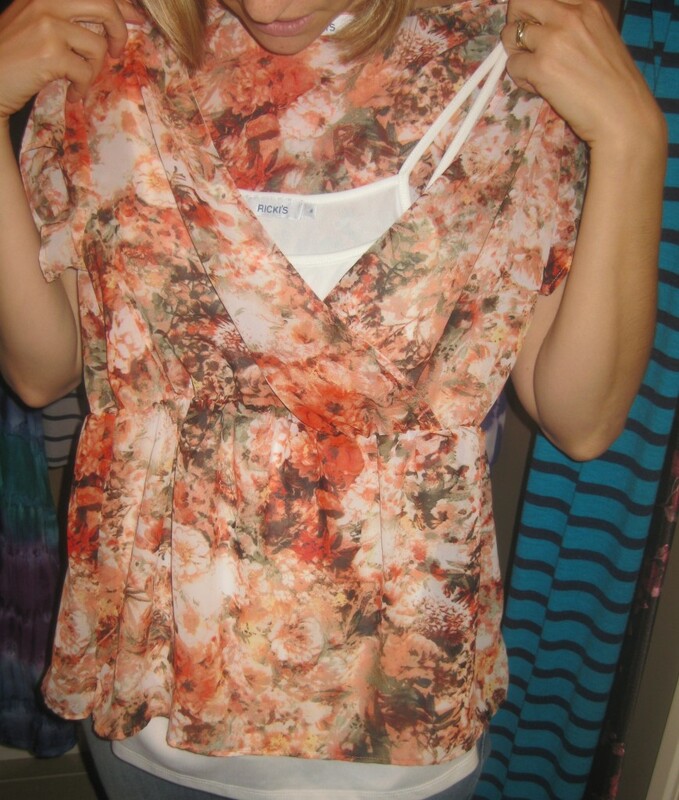 I assured her that she will likely find something similar thrifted, but I think we better go just to prove my theory. 😉 Once again though, the colours, style AND FIT need to spark joy for a piece to earn a place in your wardrobe. 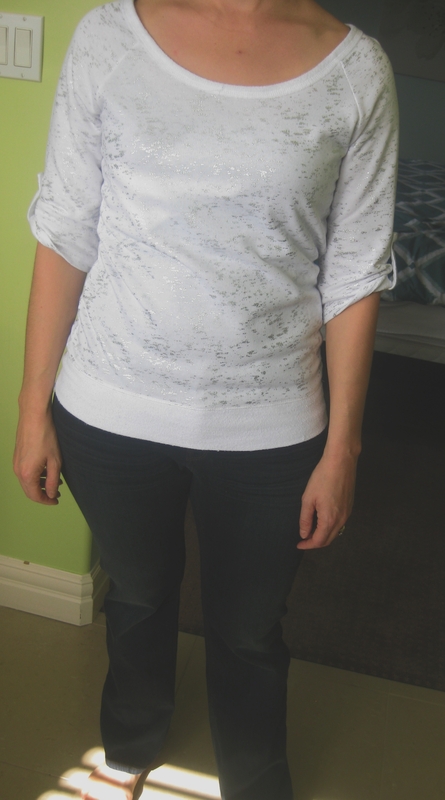 Rachelle’s daughter bought her this sequined top – great taste little one! And why not wear sequins to work?! Little girls love sparkly things and pretty teachers and of course PINK! This lace top is so pretty, so Rachelle’s je ne said quoi. (Actually, I do know. It’s Rachelle’s STYLE! She gravitates towards romantic pieces with interesting details.) It looks fab with jeans and will work for work with a blazer or cardi. This cute mod-style dress is starting to pill, but *elle aime ca* and can probably get another season of wear before donating. 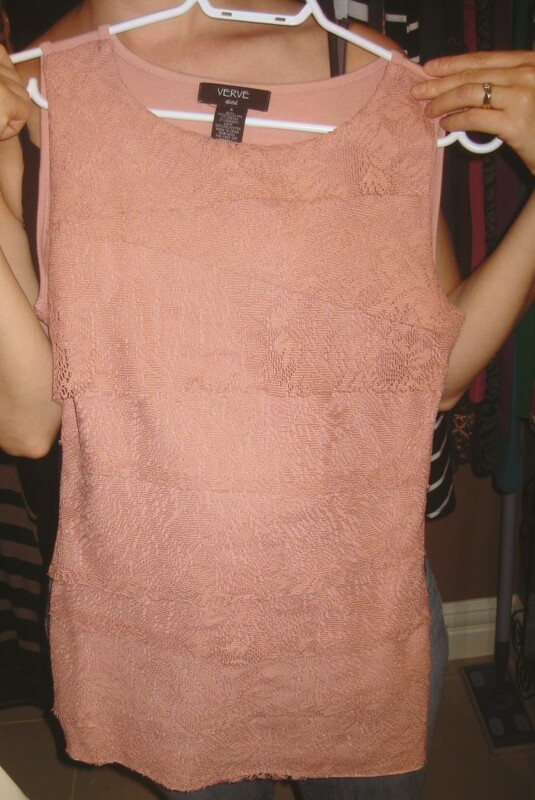 The very first dress Rachelle ever bought! AND it’s Kenneth Cole! Rachelle has a nice collection of cocktail gowns which led to our discussion of having a party. 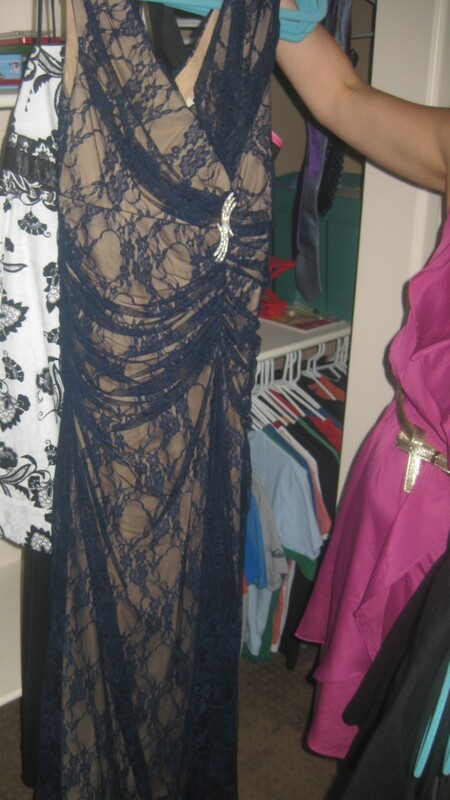 We need more soirees to wear all these pretty pieces! Anyone??? 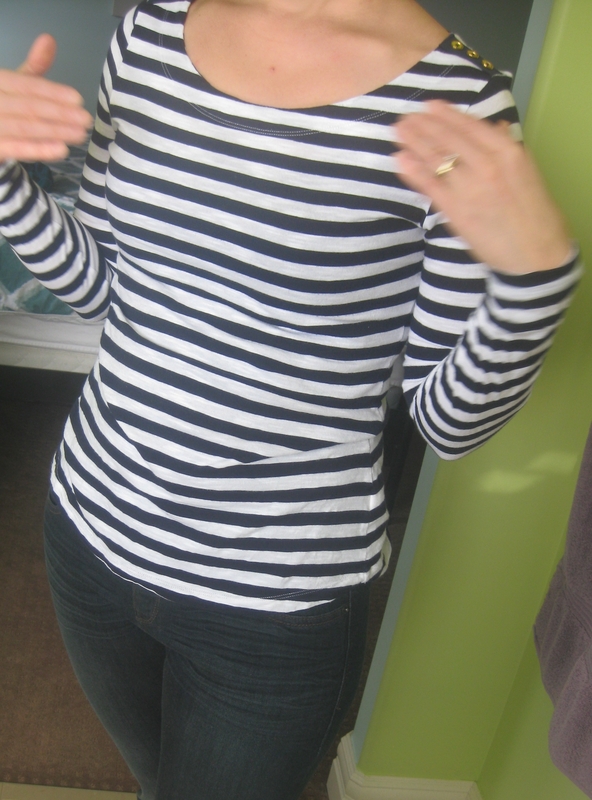 This top has the elastic band she likes but also a fussy fit, yet Rachelle loved the colours… Solution: TUCK it! 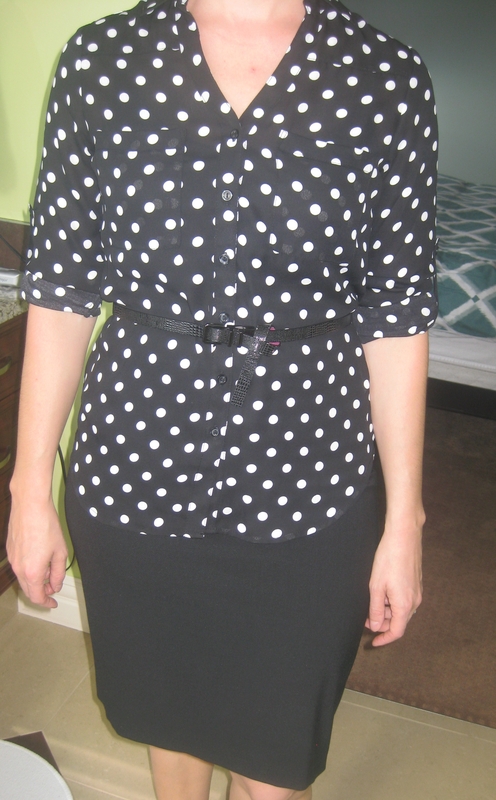 Add a belt to mark her tiny waist! Rachelle already has a Flatter Me belt…. that’s when I fell in love. Welcome to print-mixing! You can mix two patterns with similar colours and a grounding element, like the belt. J’adore this ensemble! Rachelle described this as a tee for home… POURQUOI? It is so pretty – no need to relegate it to home! Instead, play on the styling trick of mixing casual pieces with dressier pieces. Finish your outfit with the “Rule of 3” – include 3 interesting elements up top (e.g., the tee, the belt and the necklace) in order for your outfit to feel complete. 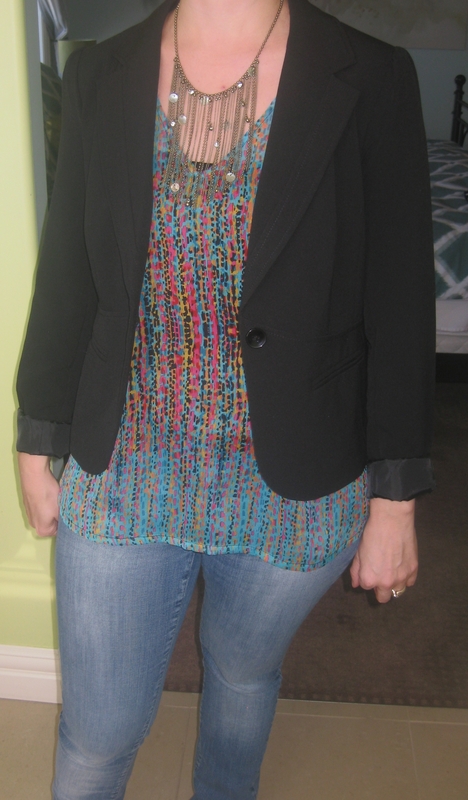 Casual tees look great with a blazer and necklace too! 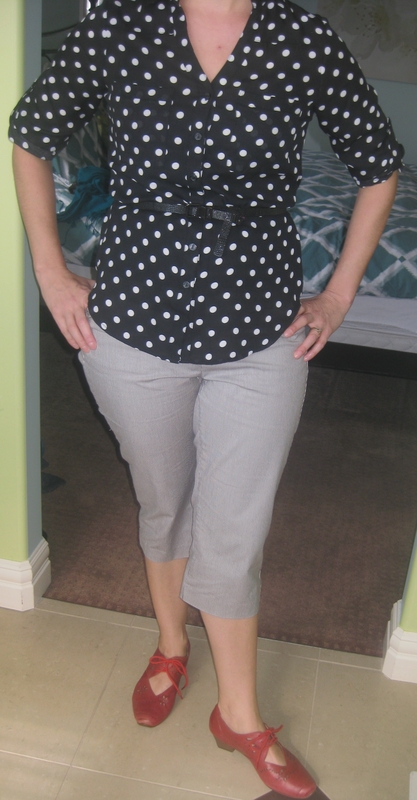 Rachelle wasn’t sure how to style this sheer shell… Try the no-fail fashion formula of short over long over skinny! 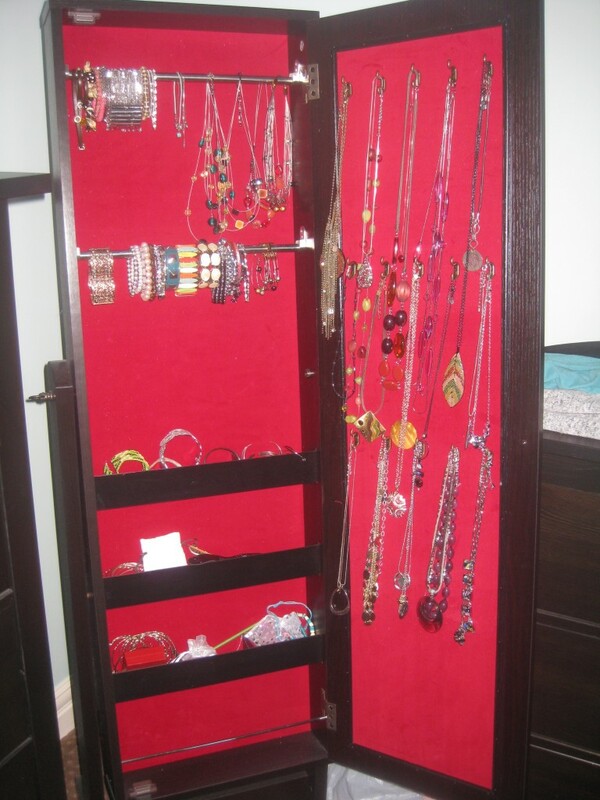 Add a cool necklace et voila! Le teacher est chaud! 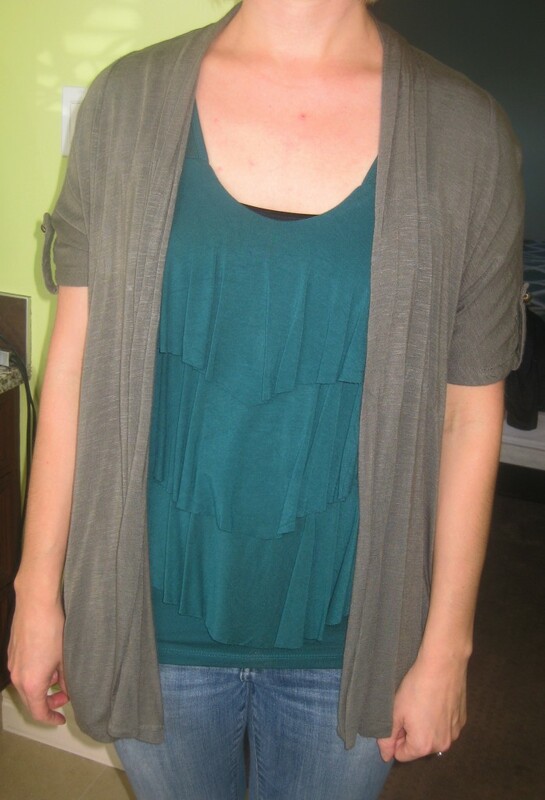 Rachelle wondered what to wear with this olive top… well, my fave is olive and navy! Give black a break and pair up other neutrals. Red or coloured shoes would be parfait here! Comme moi, Rachelle has a perfect Gap denim coat that she scrimped and saved for more than a decade ago! It is the perfect finishing layer for dresses! Blends casual and dressy, keeps you warm – c’est vrai! 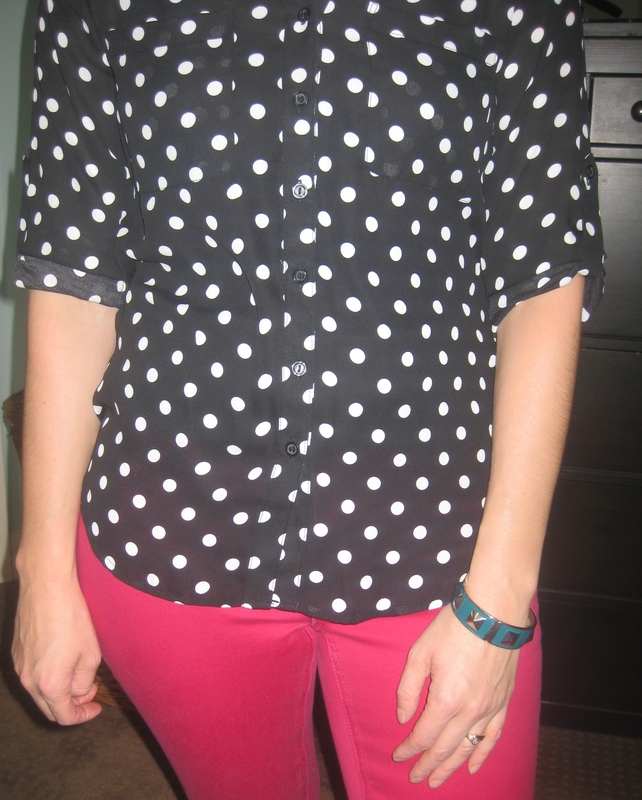 One of Rachelle’s tricky pieces is this polka dot blouse. The first styling tip was cuffing then buttoning up the sleeves. You’d be surprised how exposing some forearm instantly upgrades an outfit! 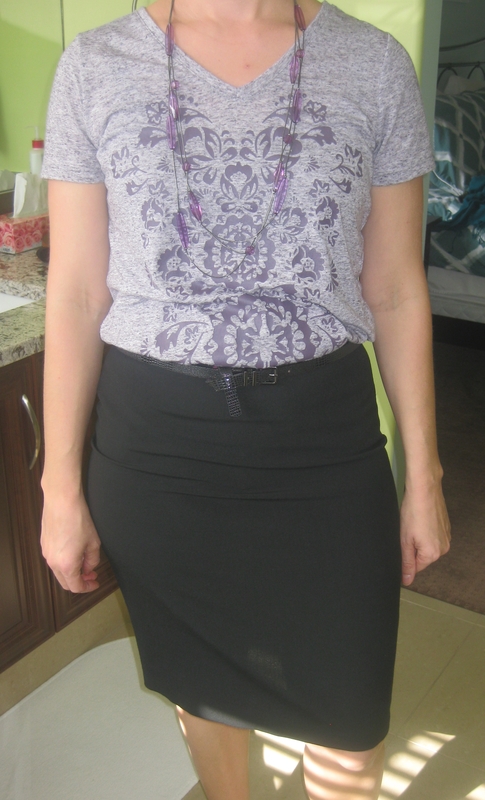 Rachelle could easily tuck it in like her other tops, but another option is leaving it loose and adding a belt! This particular duo would look AMAZING with a coloured skinny belt too! FYI, Rachelle will get a friend to punch a couple extra holes in her belts so they can be worn at the waist or hips. Knotting the end is a cool way to add an interesting element to your outfit. 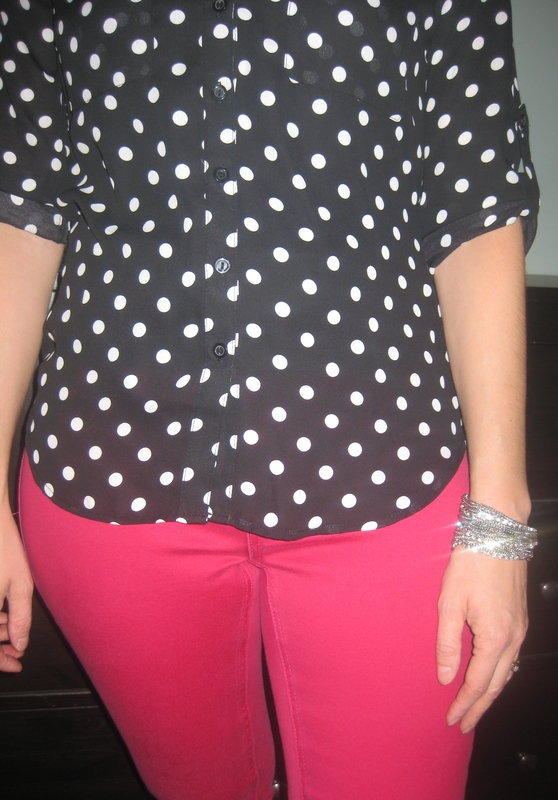 Polka dot top and striped pants = parfait print mixing! You can mix most classic prints – stripes, polka dots, plaid and floral. Cute red shoes give the pop of colour I was looking for! Another styling trick is bringing in a contrasting colour through accessories or other pieces of your outfit. 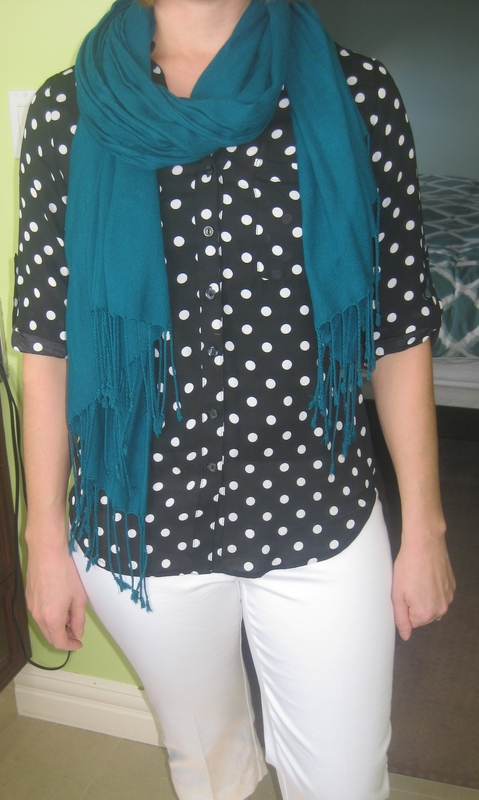 Naturellement, the classic polka dot top will work with black or white bottoms, albeit a little predictable. Add colourful shoes and accessories to keep your outfit from being too matchy=matchy. 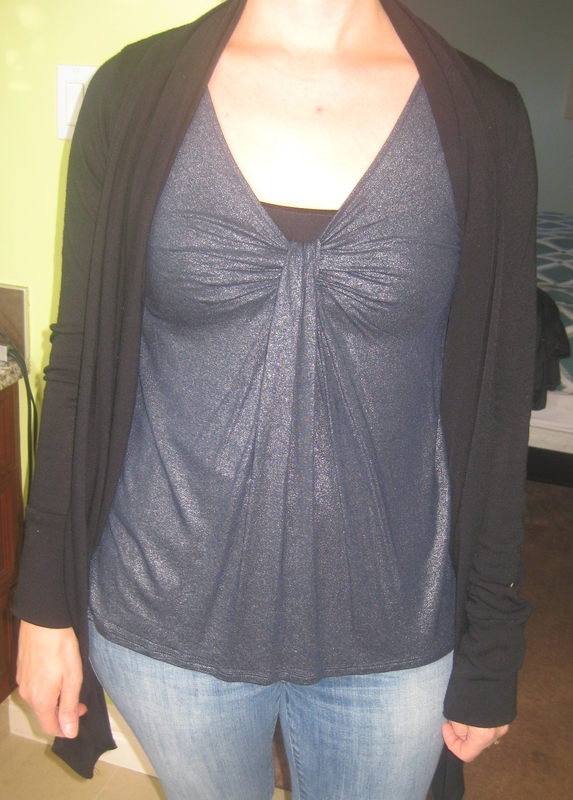 Charcoal skinnies are comfy and easy to wear with a tunic top and necklace. Now imagine this with the sleeves pushed up! Bootcut denim is making a comeback! Pair it with “basics +” – basic pieces like a sweatshirt with + elements, like a metallic print. Some bangles would finish this off! SWOON! 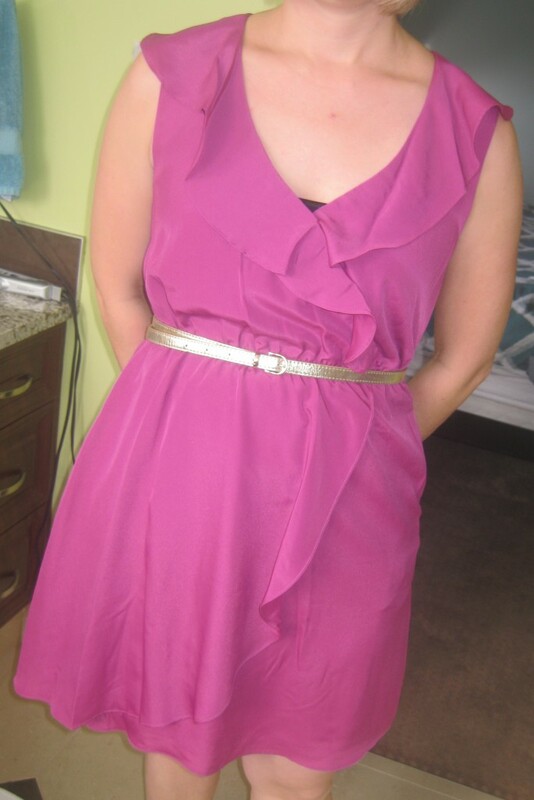 Rachelle scored this BCBG from a buy-sell site but wasn’t sure what to do with it. She tried a black belt… meh. Her gold skinny belt though works perfectly! Miz Mooz footwear for troubled feet comme moi! We also reiterated AGAIN that hand-me-downs only seem to work if initiated by the recipient, otherwise you tend to be given pieces that don’t spark joy. Pardon moi, but it’s the truth! 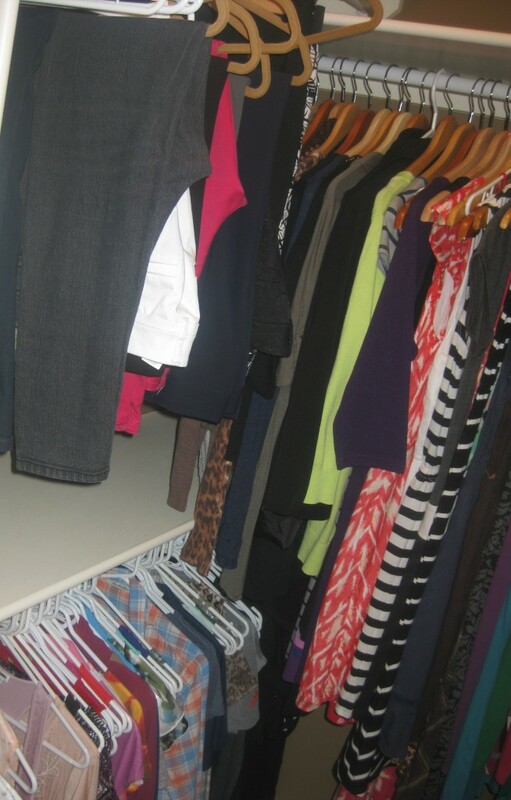 In Rachelle’s closet, we switched the tops and pants to better fit the space, reorganized colour sections from dark to light and Rachelle plans to move her bags into her closet for space-saving at the precious shared front closet! 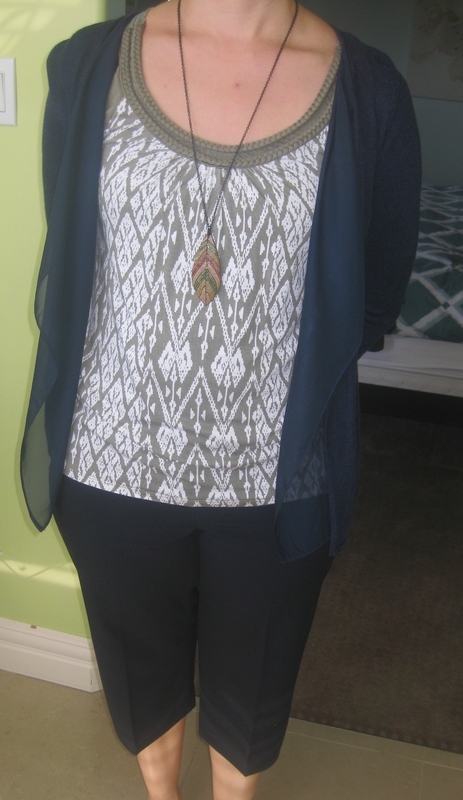 After I left to retrieve mes enfants, Rachelle ditched several sweaters – teachers get hot and classroom temps are unpredictable so you need layers like blazers and cardis that you can pull on and off! 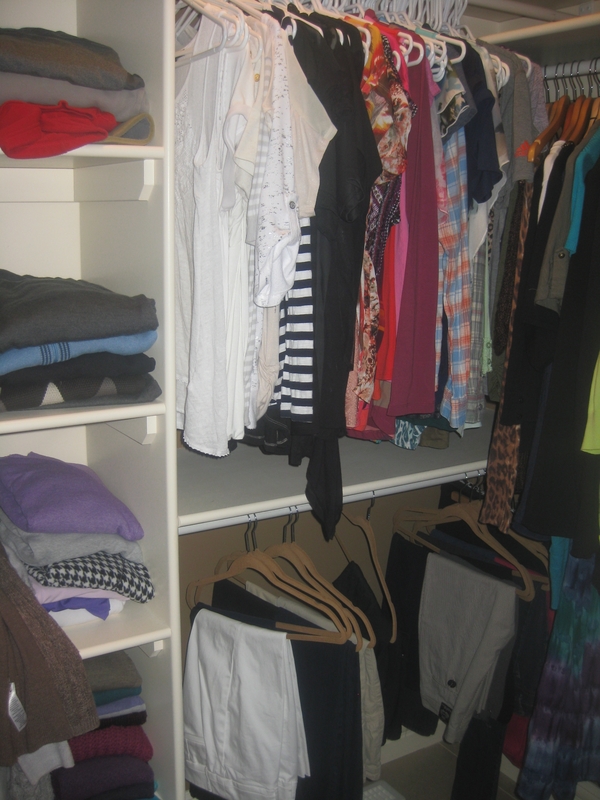 Le apres view of Rachelle’s closet. Rachelle, it was beaucoup de fun playing dress ups! I hope you find these ideas inspiring and use the styling tips with other pieces in your wardrobe! You always look like a million bucks so it can only go up from here! Let me know if you ever want to go thrifting! I’m sure you’ll SCORE, I mean, trouver beaucoup de choses!